When Sydney Sage is dragged out of her bed in the middle of the night by the Alchemists, she's certain it's because she's finally being punished for helping Rose Hathaway escape. She's surprised to find that the Alchemists—and the Moroi—have a more important problem. Jill Dragomir's life is in danger from her sister's political enemies, and the princess needs to disappear. So, Sydney finds herself in the most unlikely of places—a boarding school in Palm Springs, CA, masquerading as Jill's sister and roommate. There, Sydney not only has to help protect Jill, but prove her loyalty to the Alchemists, who no longer trust her...in between dealing with high school drama and uncovering some surprising secrets under Palm Springs' sunny facade. 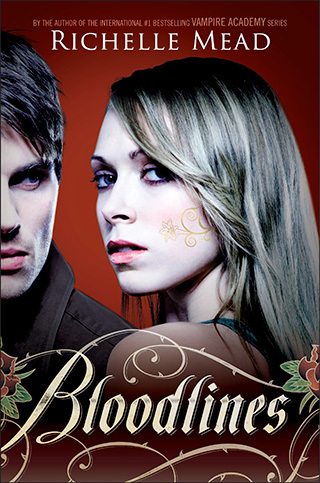 Opening up Bloodlines is just as exciting and exhilarating as starting a new Vampire Academy book, despite the different characters and their new issues. Mead's writing is as inviting and as engrossing as ever, and she kicks off this new series with some good action and great insight into Sydney's life and character. Sydney is a very different narrator from Rose—she's an intellectual who isn't very social, is focused on strategy and subtleties, and likes to think things through. However, the two girls are very similar in that they are fiercely protective, driven, and loyal, and those are qualities that will endear Sydney to fans of the Vampire Academy books. Another familiar element is the boarding school setting, which, although different from St. Vladimir's, does offer all of the fun drama and tension that was a huge part of the appeal of the early books in the Vampire Academy series. There Mead sets up a lot of mysteries and dilemmas, mainly to do with some shady dealings involving Alchemist business and a possible new facet of the supernatural world, but there is also a lot of excellent character development as Sydney gets to know Adrian Ivashkov better. Fans of the tortured Moroi will especially love this aspect of the novel, as some of his deeper, truer feelings are finally revealed. Though Bloodlines is less action-driven and is propelled along by more drama, mysteries, and conspiracies, this book isn't without some heart-stopping moments and close-calls. It's likely that the reader will be able to figure out the mysteries a bit sooner than Sydney and gang, but that doesn't keep Mead's latest from being an entertaining, breathless, and fast-paced book...and there are a few questions that go unanswered that will definitely have readers counting down until book two, The Golden Lily. Cover Comments: I admit, I wasn't too crazy about this cover at first, but the more I look at it, the more I like it. The golden tattoo is very cool, and the cover is a little edgier and dangerous, which is cool. Plus, the finished copy is a GORGEOUS package. This one hits shelves next week, on August 23rd, 2011!